Social media has ushered in – among other things – an age of staggering egocentricity. Any mook with a mobile phone can, with sickening ease and speed, announce anything to the world. Idealists regard this ability as the freedom of unregulated self-expression. In truth, not every aspect of every self is worth expressing. Too seldom does somebody with an intelligence quotient greater than the number of letters in the English alphabet announce something interesting about something interesting. Too often, social media is little more than an open sewer in which worthwhile self-expression suffocates in dim-witted self indulgence. The ability to tell anybody anything has fooled many into thinking anybody cares. Granted, those many probably did not require much effort to fool. Why do we visit museums? To see worthwhile art. What if museums let slip standards and filled themselves with every cartoon from a third grader’s penmanship notebook? We would not visit. Or visit once, just for the novelty. Once, publishing a thought to more than the number of subscribers to a neighborhood newsletter required a threshold level of intellect and at least a nodding acquaintance with the language in which publication was attempted, and typically applying that aptitude to something worth the effort and cost of publication. This was a golden age in which “selfies” did not exist – or, if they did, were not inflicted upon readers like mustard gas. Discretion existed. It was understood that, just as restraint is the essence of taste, an absence of restraint proves an absence of taste. When effort and cost ceased to constrain publication, so too did quality. Worse than a simple absence of taste (which is a personal problem) is an overinflated sense of self-importance (which can present a public problem). Those unrestrained by taste in an age of social media are free to indulge a staggering egocentricity which insists people other than their parents care that they are a) sooo tired of waiting in line at Starbucks ha ha ha!, b) thanking all my peeps for the bestest birthday wishes!!! feel sooo loved, or c) omg so so so excited for Glee season finale!!!!!!!!!! Cost and effort, the safeguards of publishing which once kept the thoughts of morons safely out of sight, are hence mourned. This may be an ironic stance for a web log to take. The medium was once rightly derided by Joe Rago of the Wall Street Journal as the provence of “the blog mob” – a territory to be avoided. But drastic times, etc. Public discourse used to be a marketplace of ideas. Entry to the market meant having something worth selling. Nowadays, the cost of admission is a cartload of garbage with which to abuse shoppers. 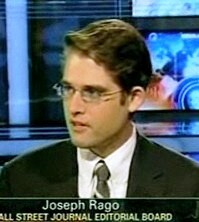 Wall Street Journal editorialist Joe Rago stirred up unnecessarily strong feelings some time back when, in that paper’s pages, he questioned the value of blogs. The meat of the argument was that there are no fact-checking or stylistic guardians at the blogospheric gates – indeed, there aren’t even gates – and, as a result, blogs spew opinions which are both mis-informed and terribly written, thereby polluting the marketplace of ideas. The mainstream media, flawed as it may be, endeavors at least to preserve some standard of factual accuracy and facility with the king’s English. This week, Mr. Rago – all 28 years of him – was awarded the Pulitzer Prize for editorial journalism for his work covering healthcare legislation. It’s a well-deserved honor and your editorial staff disloyally wishes him well, and wishes also he would write more often about Warren Zevon. Columbia University professor of humanities Mark Lilla has, in the Wall Street Journal, a thoughtful and articulate examination of the decline of intellectual conservatism… all the more thoughtful because of his admitted liberalism. That handicap aside, Professor Lilla does a very good job summing up the waning of the conservative thinking class – William F. Buckley, Daniel Patrick Moynihan, Richard Brookhiser, Norman Podhoretz – and its replacement with idiots – Sarah Palin, Bill O’Reilly, etc. The quality of national debate, Professor Lilla writes, has suffered accordingly and so have Americans, liberal and conservative alike. William F. Buckley, Jr. & dog. There’s a place, the Wall Street Journal reports online today, where first impressions are even more important than at job interviews: court. Doctors have, the author says, appeared to testify in their own malpractice trials wearing blue jeans, and one anonymous California judge admits to wardrobe considerations in her rulings: sloppy dress might bolster a case against a father accused of child neglect, she says; likewise, expensive shoes and earrings might undermine a lady claiming financial straits. Jurors are likely even less judicial. Juries pass their service by hearing evidence, considering facts, and observing participants. That means demeanor, attitude, posture, and wardrobe. Is the alleged drug dealer in a coat and tie… or does he look like a drug dealer? Though it’s nice to see this article written, it’s disheartening that it had to be. If nowhere else, a courtroom in which your interests are being decided seems the place to look your best, or to at least do your best to look better than your worst. If not out of respect for the courtroom and the American judicial process, do it for yourself and your case. John Gotti: Gambino boss looked the part. Decent prose is fast becoming technology’s latest victim. The ease and speed with which we fire off electronic mail ensures its casualty, and that casualty has become an excuse for (and cause of) garbled syntax, jumbled thoughts, and a pubescent reliance on those silly avatars of abbreviated mood called “emoticons.” This is all terrible news. The murder of reasonable expectations of style aside, untamed technology leads also to sloth and distance. Millions of children scamper home to check their e-mail and participate in “chat room” discussions, where once they involved themselves in extra-curricular clubs and athletics. Young adults discard markets for online shopping, hasty e-mails stand in for carefully composed letters and actual conversations, and text messages substitute for casual interaction. The whole thing is a mess. True, technology is a miracle of efficiency. Without it, you couldn’t read this. Whereas once telegrams took days to announce important decisions, now news moves at a lightning-fast clip around the world. Small towns, formerly dependant on the local Gazette, Citizen, or Mirror, now read the Wall Street Journal for (nearly) free every morning, online. Scientific advances spread quickly, old friends are re-connected with, and business is conducted on a global scale, at tremendous savings. But there is, or should be, more involved in life than efficiency. There should too be style, verve, and adventure. E-mails are hardly the tactile or emotional equivalent of hand-written letters on good paper, folded and sealed in an envelope. “Firing off” a resume to a boss is a far cry from recommending a new hire over drinks in the club billiards room. Are these ways antiquated? Probably. Out-dated? Likely. Quaint? Almost certainly. And terribly worthwhile? Obviously. There is a pleasure in doing things the proper way, instead of the efficient way, whenever possible because that way most often involves a personal style that adds a richness and vibrancy to those tasks. The point of propriety isn’t ease and efficiency; that’s technology’s racket. The point of propriety is personal style. Consider wearing a blazer when a t-shirt will do, and a tie when it’s not required. Learn more than one tie knot. Try writing thank-you letters, and all letters, by hand. Mail them… with stamps. Match your socks, and think about what kind of belt matches your shoes. Provide for the time necessary to disconnect, to savor anything, and then do it with style. And if nothing else, avoid the damn emoticons. According to e-mails hacked and re-posted on public file sharing sites in Russia, there has been a concerted, concentrated, and organized effort by scientists subscribing to theories of global warming to silence any scholarly opposition. There are two main schools of thought with regard to climate change: the first is that the planet is heating quickly and that human activity is the biggest, and perhaps only, cause of it. The second is that there is some climate change happening, but the causes, effects, and extent of it are not fully understood. There isn’t enough historical data available to know if any change is the result of recent activity, or historical trends… and if the result of recent activity, then what activity, precisely? If the environmental lobbies and politically correct “scientific” orthodoxies continue to hold sway, it appears that such a view will never have the chance to be completely tested. The overly vocal left won’t allow it.